﻿I was cleaning out my car the other day, and found all these gloves! I was going to bring them in the house and put them away with the other winter things, but I also found multiple pairs of sunglasses that I could not bear the thought of them getting scratched! And of course I don't use cases for them, they are too bulky. So, I put two and two together, and now my sunnies have a handy dandy 'case' so they won't get scratched, and my gloves are getting year-round use! Double win! ﻿Now the only problem is that I have 5 pairs of sunglasses in my car... I need to find them a home inside my home! 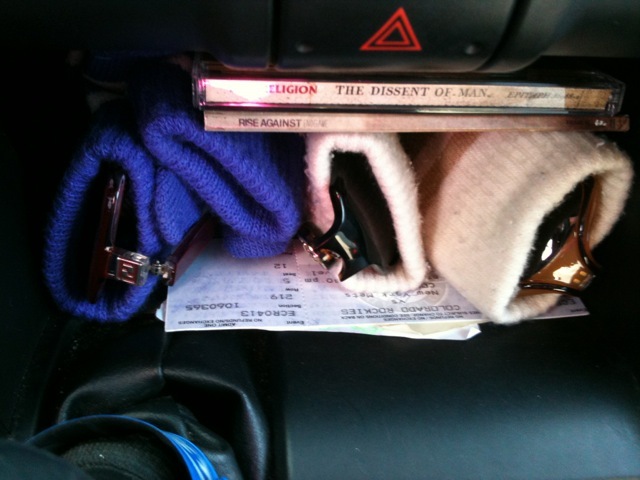 Where do you store your sunglasses?? good question. i don't have an answer, but if you find a good way, i'm all over it!! Cute idea! I usually keep my glasses in their hard cases and carry whichever pair I want for the day in my bag. The rest stay in a drawer at home. I store them in my purse..with lots of things that scratch them up..BAD idea. I need a cute little sunglass case..this has inspired me! so, so smart! my glasses are kinda all over the place because i leave them on my head too long (esp. nwo that i'm growing the bangs out!). they wind up all over. need to carry a glove with me. lol. Brilliant idea love!! Why didn't I think of that??! 5 ? :dd haha nice idea! I always keep my sunglasses in their cases at home, and then I only choose one pair at a time to keep in my handbag with me. With this method, I have yet to damage or lose a pair!